The BMW X3 is the first X model to use the automaker's 3-D kidney grille and hexagonal fog lights. 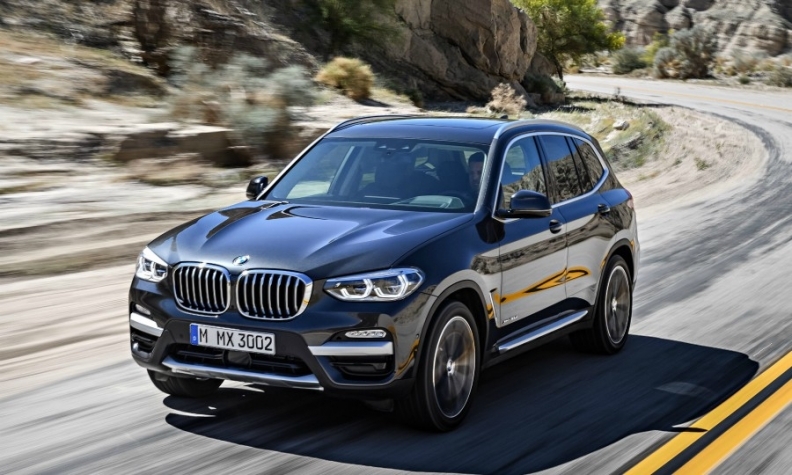 BMW has stuck to its winning formula for its X3, giving the latest version of the premium midsize SUV improved handling and agility, along with an updated design and a quieter cabin. The X3 is one of BMW's highest volume models, selling more than 1.5 million units across two generations since its 2003 launch. Global sales rose 14 percent to 157,000 last year even though the X3 was approaching the end of its life cycle. "The jump in terms of comfort and sportiness over the previous model is very big," said Arno Keller, the X3's project chief. Despite giving the SUV larger 18-inch wheels, up from 17-inches, BMW was able to lower the X3's center of gravity using ultra high-strength steel on the roof to lighten the vehicle's top. Its weight was reduced by up to 55kg to give it a better power-to-weight ratio. BMW also managed to improve the body's torsional stiffness to boost handling while distributing the weight perfectly evenly, with roughly 900kg resting on each axle. "We wanted to emphasize the fun driving, this vehicle follows you instinctively and handles curves with extreme confidence," Keller said. Interior comfort has been improved by a wheelbase that is 50mm longer than its predecessor. The X3 also offers more practicality with a rear seating bench that folds flat to offer an additional 50 liters of cargo space. To further improve comfort in the rear, the angle of the standard 40:20:40 split/folding rear seat backrests can be adjusted individually and through various stages thanks to the optional rear comfort seat. This feature also allows the backrests to be released remotely from the load compartment, which expands the standard load capacity of 550 liters to 1,600 liters. Keller said the changes make the SUV more family friendly, creating more room for baby strollers. The X3 will also play a key strategical role in the BMW lineup. In 2020, the SUV will become the brand's first combustion engine model to receive a full-electric version, which will compete with the Mercedes-Benz EQC and Audi's e-tron SUV. This story is from Automotive News Europe's monthly magazine, which will be available to read from Monday on our iPhone and iPad apps.You will also be able to download the new issue as well as past issues by clicking here. Fast Variant: The X3 gets an M-badged high-performance model for the first time in the M40i. It has a 355-hp, 3.0-liter engine. Connectivity: Microsoft Office 365 users can opt for a secure server connection for exchanging and editing emails, calendar entries and contact details. Sleek: BMW says the X3 has a drag coefficient of just under 0.29, a benchmark setting for its segment, which has helped to reduce cabin noise by creating a cocooning effect.